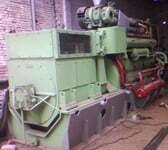 ALL.BIZ Pakistan Pakistan products Power engineering, fuel, mining Power plants and distribution systems Generators and Magneto Generator Uesd 1000 kVA HFO Wartsila Generator for sale. Uesd 1000 kVA HFO Wartsila Generator for sale. A & J International, Company. Used 1000 Kva HFO Wartsila Gas Generator for sale. Frequency:-50 Hz,Voltage:-440/220 , Phase:-i/iii , P.F:-0.8, Canaopy:-Optional.